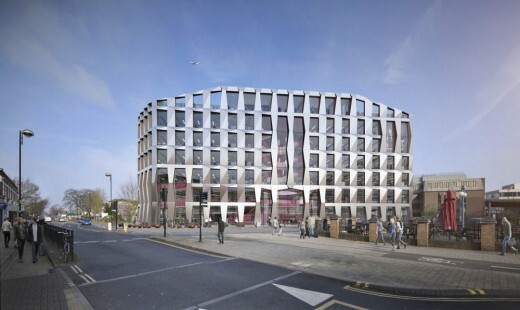 After winning a design competition last year for a new civic centre for the London Borough of Hounslow, Sheppard Robson has received planning permission for the 16,000 sqm project. 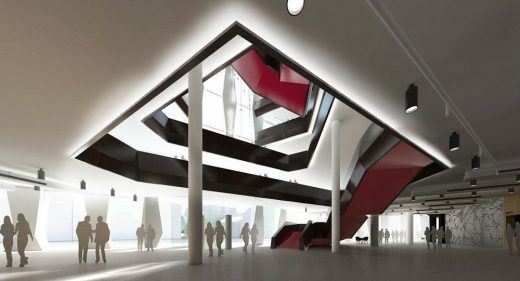 Working with Bouygues Development, the new facility will create a distinctive architectural form that gives the new building a strong civic presence within the community, with the design promoting a feeling of openness and creating connections between the public and private functions of the building. The external elevations of Hounslow Civic Centre help create a civic building that commands a presence within the community and addresses the adjacent high street. The facades are informed by a singular design approach, creating a consistent architectural language to all elevations. This vocabulary is derived from glazed bays separated by extruding geometric forms made from anodised aluminium, which vary in depth depending on the orientation of the façade. The shading strategy tunes each elevation to its orientation. 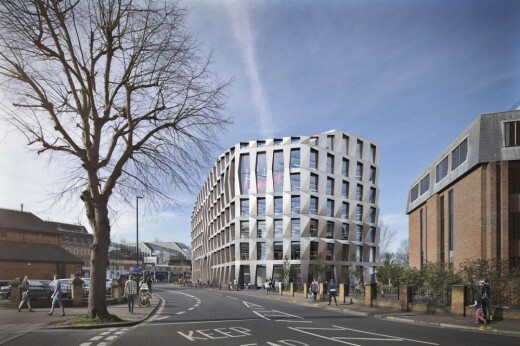 The façade maximises natural light by incorporating large windows and the solid elements minimises solar gain, cooling loads and consequently the energy consumption of the building. The geometric forms of the Hounslow Civic Centre façade vary, becoming elongated to signal the entrance at street-level and the civic chamber at the top of the building. The overall effect of the façade is a legible structure where there are views into the building from street-level as well as visual links between the public-facing facilities, civic chamber and council’s offices. The seven-storey structure positions public-facing amenities at the ground floor and a library, adult learning registrar at first floor. Above this are four floors of office spaces for the council, with the civic chamber positioned on the top floor. 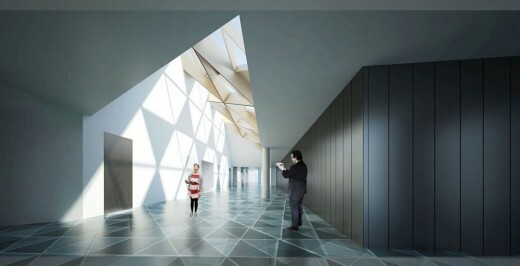 The civic chamber – with increased floor-to-ceiling height – is a prominent feature of the building’s external envelope whilst also framing views of Hounslow.